Microwave Cheez Whiz briefly to soften. Blend together Cheez Whiz and Ranch dressing. Good with crackers, any kind of chips or raw veggies. 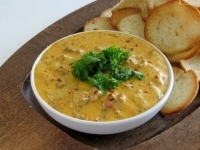 Recipe categories: Appetizers, Dips, Cheese.